The Asterisk Manager Interface (AMI) is a client/server model over TCP. With the manager interface, you'll be able to control the PBX, originate calls, check mailbox status, monitor channels and queues as well as execute Asterisk commands. AMI is the standard management interface into your Asterisk server. You configure AMI in manager.conf. By default, AMI is available on TCP port 5038 if you enable it in manager.conf. The logger should work in TCP client mode. The PBX being in permanent listening on port 5038, therefore you need to specify x.x.x.x:5038, where x.x.x.x should be the IP address of your PBX (e.g. 10.0.0.150). Our software should work in the TCP client mode. It means that our software will initiate connection with the PBX and the PBX will work as a server. 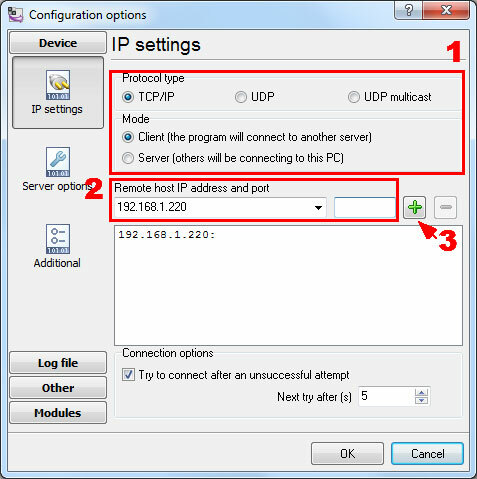 Add one or several PBX IP addresses here (the IP address of the Asterisk [AMI interface]). The port number should match the port that you have defined within the PBX (5038 in the example below).